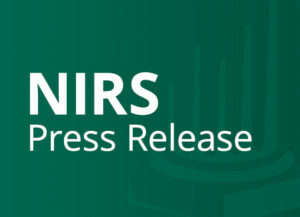 New Colorado-based study by the National Institute on Retirement Security (NIRS) reveals 82 percent of Coloradans believe the nation faces a retirement crisis, with older and younger employees expressing equal concern. Younger Coloradans are willing to save more as compared to older Coloradans, and are more nervous about the security of their retirement than those closer to retirement (44 percent compared to 31 percent). Almost seven in ten Coloradans (69 percent) regard retirement benefits as an extremely or very important job feature. Some 65 percent say they are willing to sacrifice pay for guaranteed retirement income. Almost 900,000 private sector Coloradans in their prime working years are not participating in a retirement plan at work, with more than 80 percent of that number, or about 754,000 Coloradans, working for an employer that does not offer any type of retirement plan. WASHINGTON, D.C., March 1, 2017 – Eighty-two percent of Coloradans agree that the nation faces a retirement crisis according to a Colorado-based study released today by the National Institute on Retirement Security (NIRS), and this anxiety holds steady for both older and younger Coloradans. Some 72 percent say economic conditions are impacting their ability to achieve a secure retirement, citing the rising cost of long-term care, salaries not keeping up with the cost of living, and debt as major factors making retirement difficult. Those aged 54 years and younger are more nervous about the security of their retirement than are those older (and thus closer) to retirement, with 44 percent of the younger demographic stating that they feel unprepared, frightened/concerned, and unsettled about preparing for retirement, compared to 31 percent of those aged 55 and older. The study explores Coloradans’ views toward their economic security in retirement, and finds that many feel they face an uphill battle when it comes to preparing for life after work. According to the Bell Policy Center, almost 900,000 private sector Coloradans in their prime working years are not participating in a pension or 401(k) retirement plan at work. Moreover, more than 80 percent, or about 754,000 Coloradans, work for an employer that does not offer any type of retirement plan. This is concerning given that almost seven in ten Coloradans (69 percent) regard retirement benefits as an extremely or very important factor when considering a job. 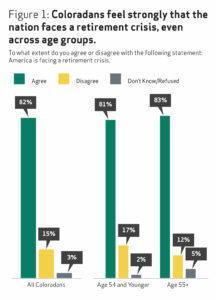 The full report, What Do Coloradans Think About Economic Security in Retirement? It’s a Rocky Road to Retirement, is available here. It is released today to coincide with America Saves Week, an annual opportunity for organizations to promote good savings behavior, and a chance for individuals to assess their own saving status. An infograhic about the report is available here. In overwhelming numbers, Coloradans are worried about their economic security in retirement. Some 82 percent agree that the nation faces a retirement crisis, and this sentiment is held by both younger and older Coloradans. Coloradans are trying to prepare for retirement, but say they need political leaders to pay more attention. Among the top ways that Coloradans say they are preparing for a more secure retirement is by working as long as possible (80 percent), cutting spending in retirement (62 percent), and saving a little more now to ensure a financially secure future (58 percent). Forty-four percent of younger Coloradans say they will save 5% or more now to help achieve economic security in retirement, as compared to 26 percent of those aged 55 years and older. Despite these efforts, Coloradans as a whole believe that leaders in Washington don’t understand the retirement struggle they face (84 percent), and need to do more. Coloradans place a high value on their retirement benefits, and are particularly favorable toward pension benefits that provide monthly checks. Coloradans place a high value on retirement benefits when making job decisions (69 percent). They see pensions as a driver of retirement security (82 percent), say pension disappearance is harming their ability to achieve the American Dream (79 percent), and believe these benefits should be available to all workers (77 percent). Methodology: In November 2016, NIRS and Greenwald & Associates embarked on a statewide telephone interview of 400 Coloradans aged 25 or older to assess their views toward their economic security in retirement and what can be done to improve their outlook. Greenwald & Associates balanced the data to reflect the demographics of Colorado for age, gender, and income. The margin of error is plus or minus 4.9 percent. Sums of two or more figures may not equal the expected total due to rounding. Greenwald & Associates is a leading full-service market research firm with unique focus on the financial services, employee benefits, and healthcare industries. We take pride in our reputation for extensive research knowledge, industry expertise, and commitment to serving the needs of our clients. We hit the ground running, saving time and money by designing better research solutions, and delivering more actionable insights with broader industry and economic trends in mind. More information is available at www.greenwaldresearch.com.